With Gang Of Four’s new look young line up sounding better than ever John Robb cheekily asks if they are the best young band in Britain? Urgent, dangerous and intense with shrapnel guitars and a bass sound you would kill for, the reconstituted Gang Of Four are, somehow, one of the best young bands in Britain. Full of energy and intensity and zig zag darting runs across the stage they are exploding with the vim and vigour of ideas, energy and action like all great young bands. Except they are built around a near 60 year old guitar player whose pursuit of perfection has left him as the gang of one after Father Time has culled the original line up. Yet here he is as vital as ever in the centre of a band that, remarkably, are sounding near the top of their game after decades of service. The youth injection oddly suits their style and makes them feel part of the now. Classic Gang Of Four have been lauded plenty of times before but there is something seriously good about the current line up. Thomas McNeice’s bass is fierce, sharp, full of post punk grind and that funk punctuation that was such a hallmark of the band’s original sound and he looks sharp and angular dangerous as well with his suicide runs across the stage whilst locking in tight with the pounding rhythm section whilst current vocalist John ‘Gaoler’ Sterry is either flailing away lost in the dark energy groove or bent double in impassioned delivery with Gill darting around the stage with that great combination of awkwardness and steel eyed resolve. It really should not work but a band is always more than the sum of it’s parts. It’s an idea. A quicksilver place that is there to be grabbed by those that dare. Also if you have a band general as smart and disciplined as Gill you will get to understand your own aesthetic inside out. The set is as machine gun tight as it was back in the day when I saw them many times and is peppered with classics like ‘At home He Feels Like A Tourist’ that still comes complete with the ‘rubbers in his pocket’ line that the BBC banned all those years ago whilst still employing Jimmy Savile, ‘I Found That Essence Rare’ is perfect post punk groove and a monstrous ‘To Hell With Poverty’ are just some of the many mainstays in the set with a few newbies that sit nicely in there. There is no way this should work but, like many bands who came from a time when new was everything and decade long careers were sneered at, they have somehow mastered the knack of making the old still sound urgent as they deliver many of the classic songs like they were written last week. The music has never dated and is still a powerful template for many young bands with that heavy bass driven groove being so hypnotic. 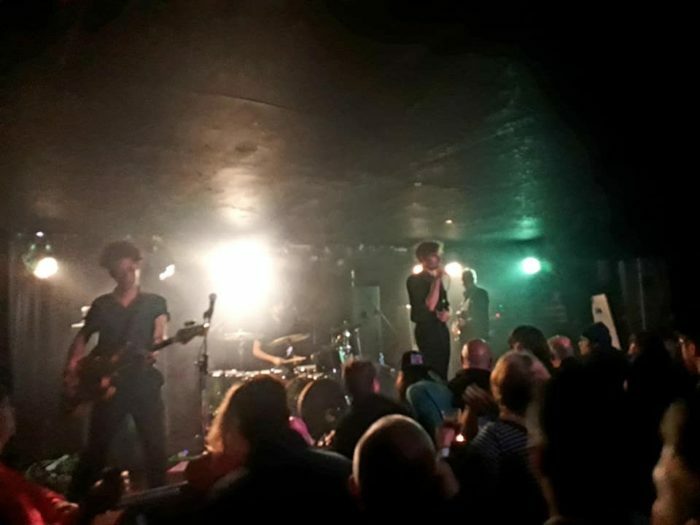 In the wrong hands they could sound like a dusty old band Urgent, dangerous and intense with shrapnel guitars and a bass sound you would kill for, The reconstituted Gang Of Four are, somehow, one of the best young bands in Britain. Full of energy and intensity and zig zag darting runs across the stage they are exposing with the vim and vigour of ideas, energy and action like all great young bands. The music has never dated and is still a powerful template for many young bands with that heavy bass driven groove being so hypnotic . In the wrong hands they could sound like a dusty old band by Andy Gill is a perfectionist and has drilled the band super tight and infused them with that spartan, post punk, non flabby, aesthetic that sets them up perfectly for this modern dance. Tonight the Gang Of Four are glorious. They sound enormous. They are thrilling. They are exciting and have a whiff of danger and revolution about them. Gill oozes intensity and still plays the guitar like its oozing electricity like Hendrix did all those years ago and his band of young droogs add a youthful exuberance and energy that electrifies the songs. Support perfectly comes from Glove – two woman with a thousand ideas. I must admit bias here as having seen them play before six months ago, I was so blown away that I signed them on the spot and will be releasing their debut single on Louder Than War records next spring. Watching them tonight is a reaffirmation of this decision with the big PA underlining their potential. They may have a simple set up but it’s so damn effective – one tom tom and a bass and a guitar swapped sound to create idiosyncratic, post punk shapes to deliver Patti Smith style poetic skree over the top. It takes you back to that post punk period were there were no rules and everything was there to be grabbed but Glove have given it a 21st century urgency and intensity with great vocals and wild eyed belief and songs that flow their own internal logic switching from urgent rushes of sound to a captivating, long sprawling piece that is a ten minute obtuse but catchy bass line and this dense thicket of dark lyrical shapes that really draw you in. Glove are going to be a big deal next year, please check them out now whilst they are still a best kept secret! I agree, seen them the night before GO4 ARE showing up the youngsters and showing them how it’s done….intense set vibrant and dynamic! Soooo sounding relevant and NOW! you’d never think this is 40 year old music. Glad you love them as much as I do–and have since 1979–but please proofread next time! Wish I could have been there. May a thousand Gangs of Four bloom! That’s not Gang of 4 — it’s a tribute band with the original guitarist. Don’t encourage tribute bands.